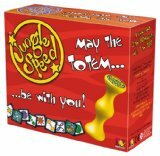 Jungle Speed is a new game that combines fast pace card games like Spot It and Blink with an extra twist, a “totem” that you have to physically grab to win the mini-round. Game play is pretty simple though it does take a few readings of the directions while playing to figure things out. As usual, dads with short fuses should read the directions ahead of time instead of yelling at the kids for jumping ahead. Cards are divided into even piles for up to 10 players. Each player turns over the top card on their stack one player at a time. If the card matches the shape of another already turned up card of any other player, one of the two players has to grab the totem (a yellow plastic column) before the other person. The loser has to take the winner’s cards. The objective is to run out of cards. There are other cards that do variations of this, or that change the matching to color, but the game is easy to understand after a few run-throughs. We had a lot of fun playing this game among two kids and a dad. My youngest, age 7, squealed with excitement when someone made a mistake or missed the match completely. We all wanted to play the game again, which is alway a good sign in a house with a few too many group games to play. I’d recommend Jungle Speed for kids 6 and up, as well as dads who like a fast-paced game that requires sharp eyes and fast hands. This game is another winner that only take 15-20 minutes to play, after which dad can bow out gracefully if he needs a break, leaving the Round 2 to the kids.